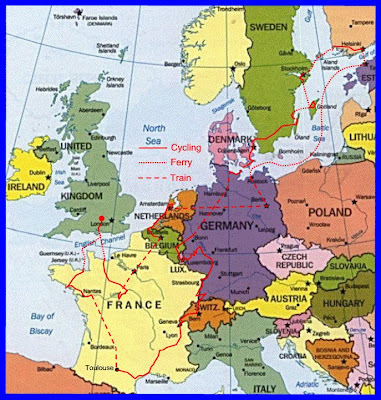 From 29 April 2001 to 3 September 2001 we set off on our tandem for a tour of France, Switzerland, Germany, Luxembourg, Denmark, Sweden, Finland, Netherlands, Belgium & back though France. Our bike is a Cannondale MT1000 tandem. We bought our tandem in 1997 and we both agree it is the best thing we have ever done! Tandem is a great way to travel. For this trip we also purchased a Cycletote trailer to carry our camping gear and luggage. The trailer worked really well, and keeps the weight off the bicycle. It is also equipped with 26" wheels and hub brakes which improved our stopping and enabled us operate with our existing Magura cycle brakes only. We set out to camp unless we were staying with Friends. Our trip was 127 days long, and we camped for 100 nights. Overall we stayed in 73 different campgrounds. Campgrounds were plentiful in all countries and overall the quality was good. France was generally the cheapest for camping, but most basic. Other countries were often better equipped with camper kitchens. Camping is a great way to meet people! 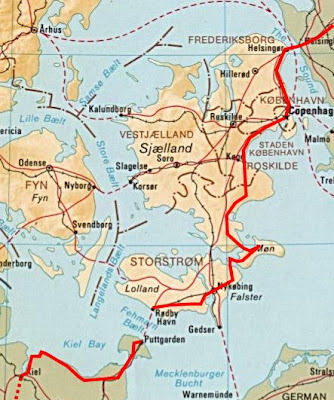 A number of times we used other forms of transport, mostly ferries and trains. This was generally not too difficult, although tandems with trailers on trains in France are problematic! We thoroughly enjoyed cycling in France. 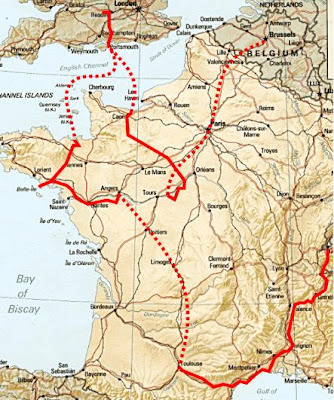 It has a fantastic network of back roads, so as long as you are armed with a good map (Michelin 1/200 000) then you are set for a great ride. All of the back roads we rode were very well marked and signposted. We found tourist offices were common, with an extensive range of information, particularly about where to find one of the abundant French campgrounds. And campgrounds were almost always well signposted. The other exceptional feature of cycling in France is the food. When cycle touring you can almost eat what you like and still lose weight. We mostly did our own cooking, which was easy with the plentiful supply of markets and hyper marches. It was also very hard to ride past a boulangerie and not eat their delicious pastries (chasson aux pomme was my favourite!). Campgrounds in France are abundant, cheap but somewhat basic. Generally they have no kitchen facilities, and more often no toilet paper. But as long as you go prepared they work out fine. We loved our time on the Western side of Switzerland. We first enjoyed the views and scenery around the edge of Lac Leman. We were particularly taken with terraced hillsides covered in grapevines on the northern side of the lake. We were both captivated by Bern, the location, buildings and views of the Alps were magic. The roads were a little busier, compared with the back roads of France. But we found many quite well marked cycling routes often with dedicated cycling paths which were scenic and enjoyable cycling. Campgrounds were easy to find and very generally very well set-up, most had kitchen facilities. Tourist offices and internet cafes were readily available. It was also generally easy to find good super markets, Co-op and Migros. We particularly enjoyed the Manor Cafeterias which serves a smorgasbord of freely cooked foods. Germany was a highlight for us! Everybody was very friendly and ready to chat. Following the Rhine River and the Mosel was a highlight. The sight of castles perched on top of grapevine covered hill sides was breath taking. There was never a dull moment when taking a break of the river bank with a caravan like procession of barges and tourist boats traveling upstream and down. There were also many riverside cafes to be enjoyed! Germany is very cycle friendly with cycle paths provided as an alternative to busy roads. Most were very well marked, however the occasional dead-end was not uncommon. we face a few challenges finding our way into Heidelberg. Camping grounds were well equipped and plentiful in Germany - most had a bier garten. Luxembourg was a revelation, as a country it was very pretty, the history is fascinating and there were some great cycling routes. On a couple of occasions we found ourselves on abandoned railways which had been paved especially for cycling. The old tunnels were even equipped with automatic lighting which was activated by motion detection. 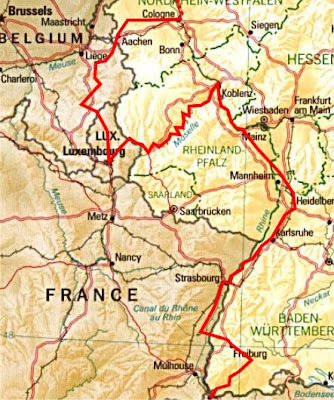 We also traversed the southern edge of the Ardennes which provided some more challenging riding and lovely vistas. In our view Belgium is underrated as a cycling destination. However I would add we met more potholes on Belgium roads than anywhere else we visited. From Cologne we took a train ride to Kiel in the North. Trains and Bikes are a breeze in Germany, even when your bike and trailer are the same length as a medium sized car! From Kiel we planned to take a ferry to Bagenkop, Denmark. We turned up at the ferry terminal bright and early only to find the ferry ceased operation 12 months before. Well never mind - we had a very enjoyable ride along the coast to Puttgarden where we took the Ferry to Rodbyhavn. Denmark was fun. 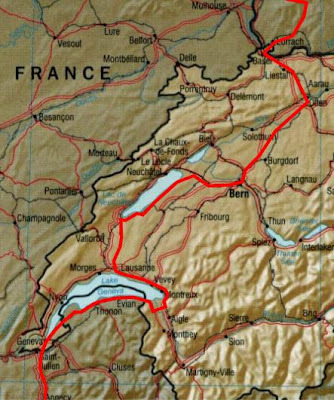 It has a well established national cycling routes which are extremely well signposted. We also enjoyed 3 days of exquisite tail winds. Often we found ourselves cruising at 45km/hr. We thoroughly enjoyed Copenhagen. We were lucky enough to coincide our visit with the annual Jazz Festival partaking of a number of outdoor concerts and a couple of great evening concerts at Tivoli Gardens. Roskidle's Viking Ship Museum is a must see as is the Hillerod Slot. Tourist offices and camping grounds were great in Denmark. Sweden was a surprise to us. In many ways it was not unlike New Zealand - lots of green and not many people. We were taken with the traditional red farm houses. 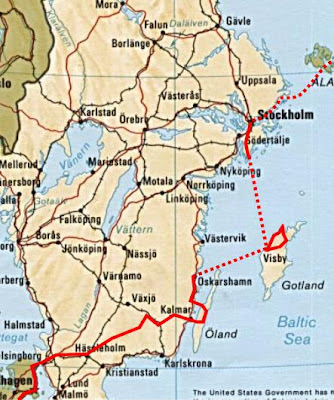 We also got to do a bit of Island hopping to Oland and Gotland. Both are worth the visit. Oland is pepper with 400 traditional windmills and some interesting coastal views. Kopingsvik was hopping with holiday makers - it was a weird experience for us to sit on the beach with bright sunlight at 10pm! Definitely seek out and try the traditional food, Olandskroppkakor - potato dumplings stuffed with pork and Lufsa - thick pancakes! Yum yum! 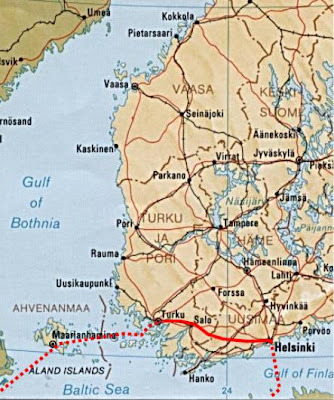 Gotland is about 5 hours by Ferry from mainland Sweden. Visby is fascinating with it's walled city in the middle of the Baltic! The island was also packed with holiday makers, many of whom had left their cars on the mainland and opted to hire bicycles with trailer to carry their luggage. We were right at home with our touring set-up. Stockholm was the most beautiful city of our trip. The builds of the old city, the bustling harbour dotted with islands, the rocky cliffs, plentiful trees and amazing twilight evenings were captivating! Cycling in Sweden was mostly on the roads, which were never too busy. Camping grounds were good but very busy during July! Finland was an absolute highlight for us - the country was fun, but especially for us the people were great! We have some cool friends in Finland. After numerous work related visits to Helsinki, mostly in winter, it was refreshing to see the summer side of Finland. Our evening with Hannu and Leena at their idyllic summer cottage, nestled in woods on an island, surround by a lake near Kisko was an experience we will never forget. The fair weather, food and fellowship was awesome! - not to mention the sauna. Tuomo and Nina were the consummate hosts to us in Helsinki. Nothing could ever be better than Chez Tuomo cuisine washed down with a buttery Chardonnay! Helsinki offered some great sightseeing and some extremely good inner city cycle paths. Sorry - no advice on camping in Finland - we did see one campground in the distance - it looked ok.
Our advise about Finland is - don't take a willy nilly approach! Spend more time than we did and enjoy this unique country. The Netherlands is a cycling paradise. It seems that you can go just about anywhere by bike and almost never have to use a road. When we arrived in Amsterdam in early August it was bustling with tourists and most camping grounds were bursting at the seams. This was also true for the majority of coastal camps we stopped at. We had wonderful experiences cycling along the coast on amazing cycle "roads". At times we had sea and sail boats on one side of the dyke and paddocks on the other. Cycling along canals was another delight - there is always plenty of activity to keep you entertained! We enjoyed a visit to Madurodam in Den Haag (The Hague). 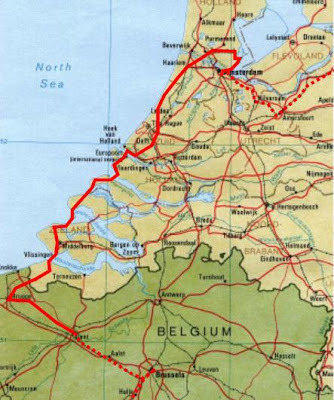 This is miniature Holland and is a fantastic way to see parts of the country that you might not get to visit.